Brand new Rickenbacker 4003s Bass Guitar - Jetglo. Unplayed, not been a demo in a store, made in USA. 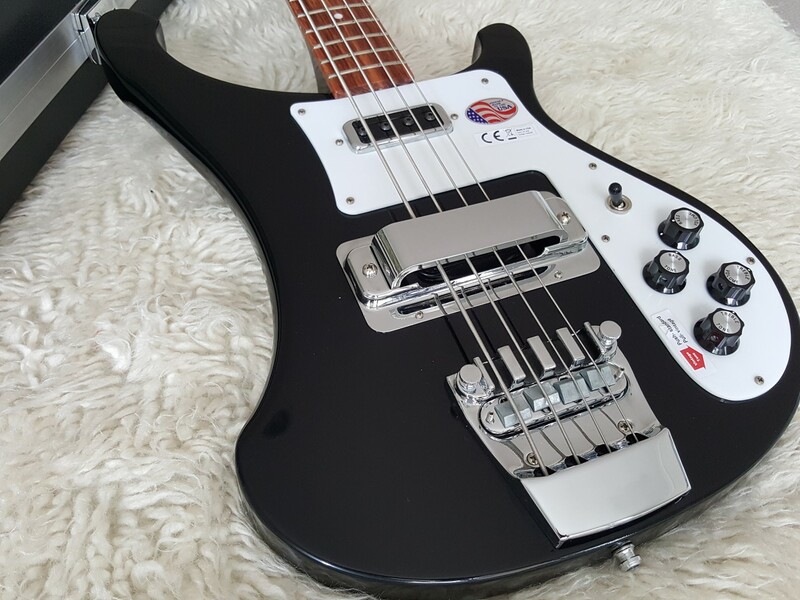 There are classic guitars everywhere but rarely does a Bass guitar generate such a loyal following as the Rickenbacker 4003. New for 2015 the 4003s takes you back to the classic 60's style models loved by early rock pioneers. This traditional Rickenbacker bass style with dot inlays and no binding was prized by Paul McCartney and Chris Squire when they received their first 4001S models back in 1964. Players cherish the traditional look and rounded edges that many claim make it more comfortable than the 4003. By taking the bass back to its roots Rickenbacker have made an instrument that's great to play. When you buy a rickie bass you're investing in a real piece of history, they are treasured parts of many bass players regular gigging rig with reliable sound quality night after night. The updated 4003S version comes with the improved dual trussrod system and of course the famous solid bass tones, ringing sustain and treble punch Rickenbacker are known for. Comes with mono output, as well as standard Model 4003 single coil pickups, keywinds and pickguards. The updated 4003S features a distinctively carved maple body, a 33-1/4" maple neck, and a rosewood fingerboard to offer that world-famous Rickenbacker playability and comfort. Fitted with a pair of single-coil pickups, the 4003S delivers all of the sustain, solid lows, and high-end punch that helped make Rickenbacker basses legendary. It sports a 3-way switch and a simple 4-knob control layout that consists of independent Volume and Tone controls for each pickup. To give your sound some vintage flavor, just pull up the Treble Tone control. Finally, a set of premium Schaller Deluxe tuning machines and a RIC bridge round out the Rickenbacker 4003S. Comes complete with a hardshell case.